A bridge was needed. A pedestrian bridge from the cabin to the studio. It had been on the "to-do " list for too long. 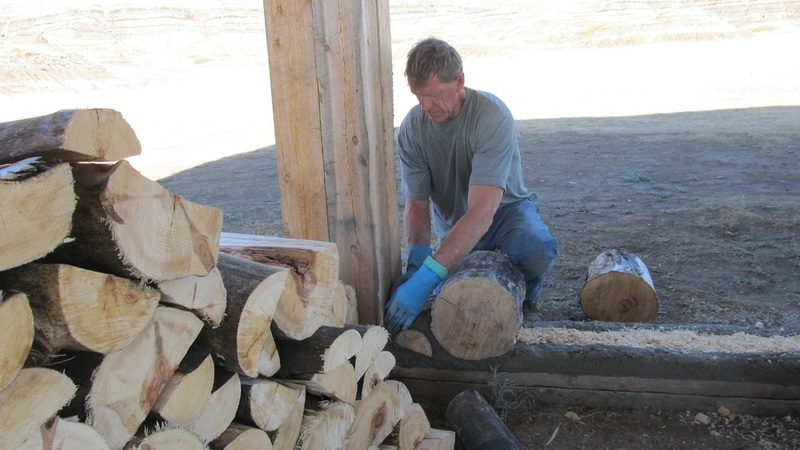 Part of the reason was that other projects took precedence... cabin building, cord-wood/straw-bale studio, the garden, the solar shower, road improvements, woodshed, building cabins, making art, etc. The other "problem" was coming up with a design that was practical. It needed to require a minimum of precious time consuming labour, as many on hand or easily available materials as possible. A small budget and a visual outcome that worked with the existing buildings and would blend into the landscape. Solution... the answer came from my son Ryley.... build a pallet bridge. When measured It turned out to be a longer span than the "hoped for" distance across which was 30'. When measured it was 55'. A stronger support system would be required. Solution ... a bridge built from pallets. See image below. Shocked by what I woke up to I was driven to have the bridge standing asap. I had already developed an emotional attachment to my little bridge... something about bridges that somehow capture our hearts no matter our age. I just wasn't sure how to do it with no power lifting equipment available. But with a little ingenuity and some deeply called for braun I had it standing in place AND secured in 2 hours. Felt great! Image below shows Chica checking progress. She loves running across the bridge and was impatient for it to be back in place. To this day Sir Rufford will not put even a paw on it.... he has trust issue's....lol. Images below show bridge before the storm Still to come bracing, railings and of course get rid of the ugly green 2x4's. I will be posting more as the project nears completion. Comments and blog followers most welcome. Cooler weather on the horizon. Time to turn my attention to stock-piling firewood for the long, cold Alberta winter. The logs are leftover from the cord-wood studio construction. 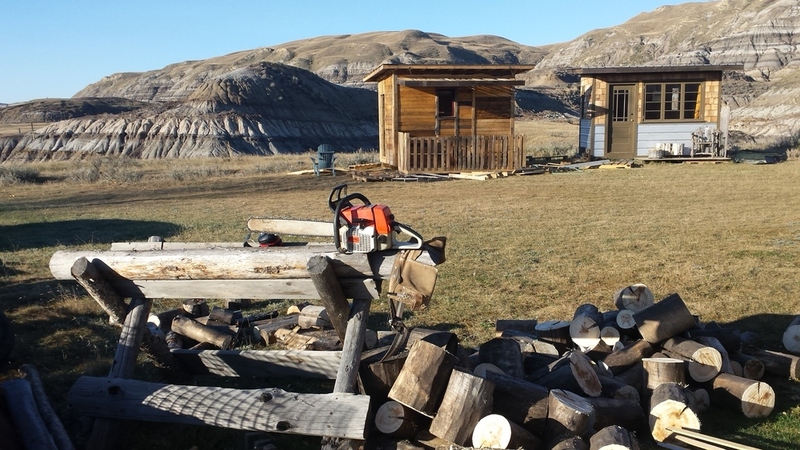 I actually made a living income several years ago supplying firewood to buyers in central/southern Alberta. I fell, bucked and split 85 cords,4x4x8 ft. birch. A lot of physical work but very enjoyable surrounded by the therapeutic environment that comes from being alone in the forest with nature. Through time & experience I've learned the burn times and heat output of various species of trees. When stock is low I burn spruce. If seasoned it burns hot & fast puts out good heat and clogs your chimney. Not a good night time heat source unless you want to get out of bed every hour to feed the fire. Birch is cleaning/long burning with good heat value. Apple is the best that I've had in all categories, a good sized log will last through the night... a rare find. Willow is great, burns hot, long lasting. Popular is clean burning, medium heat value, not a great overnight choice. Cottonwood, the supply that I found is some of the oldest in north America, 400-600 years old... a killer to split. sledge hammer pounding on a splitting axe. By far the toughest wood I've had to deal with. Burns long, clean, low heat value. I'm presently burning tamarack, 2 cords gifted, delivered split & seasoned by a generous family member. It burns long, clean and provides good heat value. Also great for fence choice for fence posts. Newly built cabins in the background waiting for their new homes. We're into September here in Alberta. With cooler temperatures on the way my thoughts have turned to gathering winters supply of firewood and sealing up the cabin and studio. The photo's shown below are from the beginning stages of construction. I will be posting current ones over the next couple of days. I'm starting with the studio. Finishing the west cord-wood wall that remained unfinished for more than a year now...to long. It wasn't a priority last year, the straw-bale part of the studio was given precedence. It feels good working on the cord-wood wall. It's a different pace than straw-bale. Your mood has to be right, patients is important, try to push it and bad things happen... uneven walls, rough finishing, mortar " a mix of 9 parts sand, 3 parts lime, 3 parts straw, 2 parts Portland" is too wet/too dry. Worst of all rushing does not speed the process, I know I have tried. What it does do is create frustration tipping toward anger. Best to put on the music, get your hands in the mud and find the rhythm. A nice part of cord-wood construction is that you are doing 4 different things at the same time... building a wall, insulating it with sawdust, finishing interior/exterior surfaces. A big part of cord-wood construction is log selection. Remember your both your interior and exterior walls will be exposed when complete. Whatever placement both logs and glass bottles will be what you see for as long as you live or as long as you life in the space. You want to make it as appealing as possible.